Nothing says winter’s here better than the taste of warm and fragrant mulled wine. We’ve got the perfect fail-proof recipe and tips to make the perfect mulled wine! Mulled wine dates back to medieval times and was viewed as a health potion enjoyed by rich kings. Spices were attributed to having a medicinal affect and were worth more than their weight in gold! Now, thankfully, you don’t have to be royalty to enjoy mulled wine! Mulled wine, the Sangria of Winter! The secret to great sangria is balancing flavours. The same goes for mulled wine. Finding the perfect balance of sweetness, fruitiness and acidity isn’t difficult. Typically, you would start with a cheap red wine, cover it up with a ton of spices and citrus for acidity – and voila, you’ve made a good mulled wine. 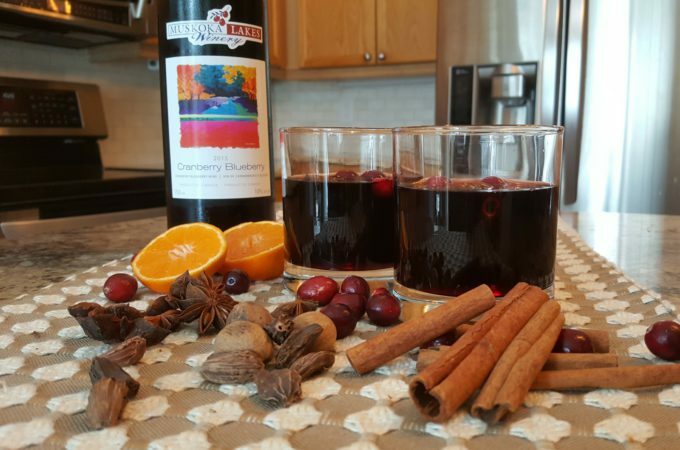 For a different, and we think much tastier recipe – make your mulled wine with Cranberry Blueberry wine from Muskoka Lakes Winery. 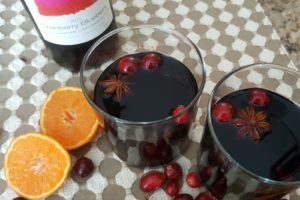 Cranberry Blueberry wine already has the acidity from the cranberries (we like to call cranberries, “the citrus of Ontario”) and the fruitiness and sweetness from the blueberries – it’s a great mulled wine base. 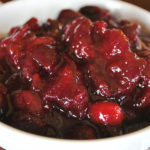 Optional – sweeten to taste using maple syrup! Place the wine and spices in a large pot and heat on low for 15 minutes. Be careful not to boil the liquid as it will burn off the alcohol and affect the overall flavor of the wine. Then, take the pot off the heat and leave it to sit for a half hour allowing the flavours of the spices to infuse into the liquid. Strain out the spices and save for later. Afterwards, gently reheat the mixture before serving and pouring into glasses. Add spices and wine into your coffee pot and “set it and forget it!” Literally, turn on your coffee maker and walk away. The beauty of it is that your coffee maker will never let your mulled wine boil. Strain out the spices and pour back into coffee pot or a jug. Or pour the wine back into the bottle and keep it heated by placing the bottle in a warm crock pot. 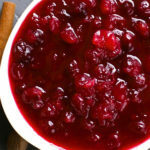 Pour wine into mug or glasses and add nice looking spices as garnish – star anise, cinnamon sticks and floating cranberries! Traditional spices are cinnamon, star anise, cloves and nutmeg. We never stick with the ordinary – try adding cardamom pods, vanilla pods, orange peel, black peppercorns, all spice, bay leaf, rosemary or ginger! 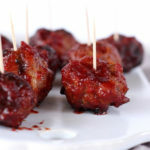 Aim for at least five quality spices, avoid powdered spices and choose whole ingredients to develop a nice depth of flavor and avoid a yucky gritty mess. 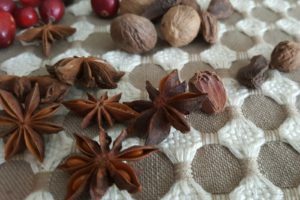 Be careful not to use too many cloves, star anise or cardamom pods as their flavours strengthen the longer they’re left to sit. Choose picture-perfect spices like star anise and cinnamon sticks and post lots of photos on Instagram – go ahead, make your friends jealous! 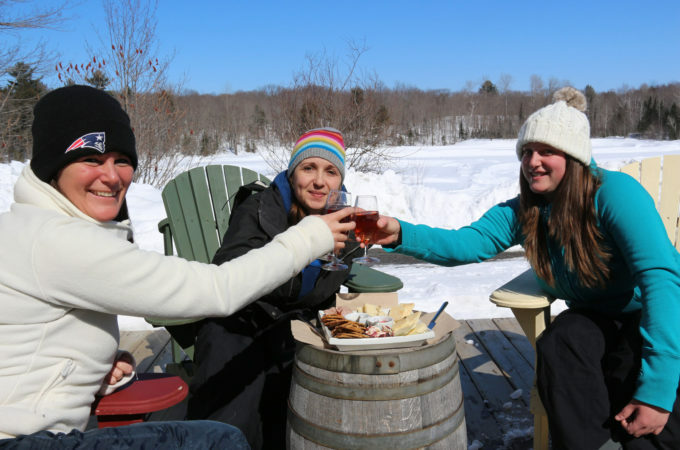 Come visit Muskoka Lakes Winery and enjoy a glass of mulled while ice skating the ice trail at Johnston’s Cranberry Marsh!